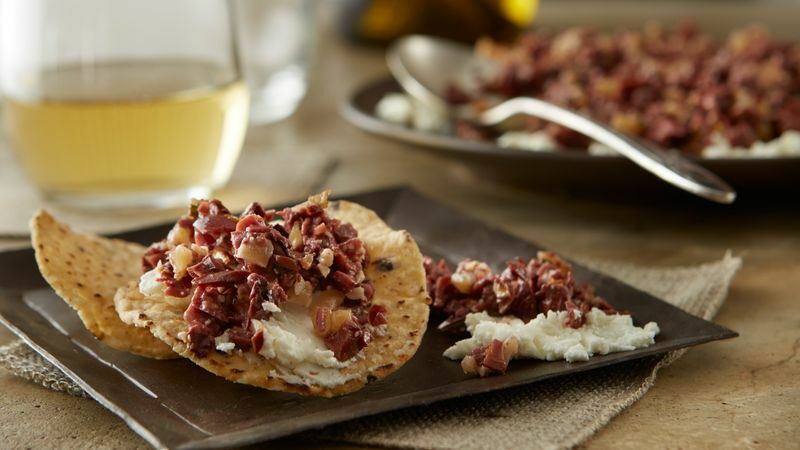 In food processor or blender, place all Tapenade ingredients except walnuts. Cover; process, using quick on-and-off motions, until slightly coarse. Stir in walnuts. Cover; refrigerate 1 hour to blend flavors. If desired, soften goat cheese on microwavable plate in microwave uncovered on High about 10 seconds. Spread goat cheese into 1/4-inch layer on serving plate. Top with tapenade; drizzle with additional olive oil. Garnish with rosemary and thyme sprigs. Serve with chips. *Mascarpone or cream cheese can be substituted.